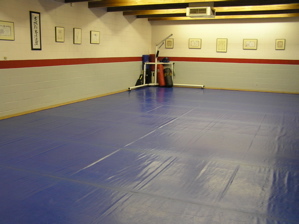 The Kojosho Kempo Karate schools offer a study in traditional martial arts. Mr. Absher, who founded the system in 1966, has studied Kempo, an art of self defense that traces its origins to China. Additionally, he has studied both Japanese and Korean Karate, earning Black Belts in Kempo, Chung Do Kwan and Tae Kwon Do. The new student can expect to learn aspects of all of these styles. Typically, the student is first introduced to a series of kata (prearranged formal exercise) historically shared by both Japanese and Korean Karate. This will enable them to coordinate hand and foot offensive and defensive movements. These styles are physical in nature and give the student a great workout. The Kempo forms linked together by Mr. Absher utilize slower and more natural movement, and when done solo or two person will give the student a feel for distance and timing. It will also introduce a variety of combinations that will further imrove hand, eye coordination. Other Kempo sets deal with defense against grabs and holds, together these styles offer the beginning student an introduction to both the hard and soft sides of Karate. For information on class schedules or cost, contact: Shane Absher at the school or (505) 228-5592.